So it has been written, so it has been done. 6 years and 400 episodes later, we are still bringing you the best automotive podcast in the land! 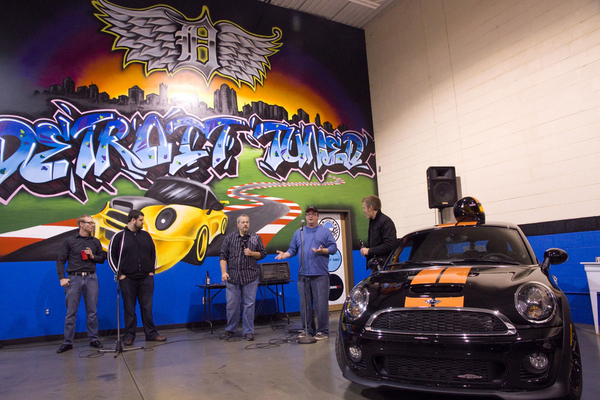 This one as you know was taped live at Detroit Tuned with Gabe, Todd, Chad, Nathaniel, me and Jim Petersen’s brand new, newly striped JCW Coupe. And before you ask, yes, it’s rad. We did some live Ask Chad too, plus Gabe and Nathaniel fielded general MINI questions. Of course, it wouldn’t be a WRR event without a few interviews, like with Nathan, Grand Poobah of MotoringAlliance.com. Photos are still trickling in over on our Facebook page. That and WRR listener Eileen shared some fantastic shots here, our man Chris posted some to his Flickr here and Henry posted some here. If you have photos (or video!) of WRR Live, hook us up in the comments! It was a fantastic time as it always is when we all get together. Big thanks to everyone that attended. To those of you that missed it, lets look forward to Woofcast 500, because you know we’ll plan something **huge** for that!. Finally, thanks to all of our sponsors to helping to make this happen! MINI of Ontario, Outmotoring.com, Craven Speed and Motor City MINI. And, of course, Motoringbadges.com. Todd did indeed see my R50 at Mickey and MINI. Haha – I know Gary. I try to watch that. I put the large part of the zipper at the top of my jacket. The bottom part is made of velvet! Should have known that after a gazillion installs you’d be way ahead of the game. Again, sweet work! After study few of the articles on your web site today, and I really like your way of blogging. I tag it to my bookmark internet site list and will be checking back soon.